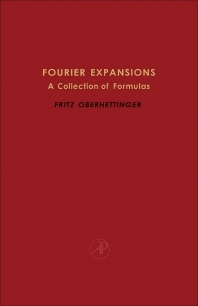 Fourier Expansions: A Collection of Formulas provides a collection of Fourier series. Its limited scope made a number of compromises necessary. The question regarding the choice and organization of the material to be included posed certain problems. In order to preserve some consistency it seemed best to stay within the framework of what one could call the ""classical"" Fourier series, i.e., those of the trigonometric and their simplest generalization the Fourier-Bessel series. The book is organized into five sections: Section I presents Fourier series with elementary coefficients representing elementary functions. Section II presents Fourier series with elementary coefficients representing higher functions. Section III presents Fourier series with higher function coefficients representing elementary functions. Section IV presents Fourier series with higher function coefficients representing higher functions. Section V presents exponential Fourier and Fourier-Bessel series. This arrangement should be helpful in equally balancing the task of either establishing the sum function of a given Fourier series or finding the Fourier expansion of a given function. It is hoped that this book will meet the requirements so often needed in applied mathematics, physics, and engineering.